Video recap of the 2018 Chinese New Year Celebration at UK. 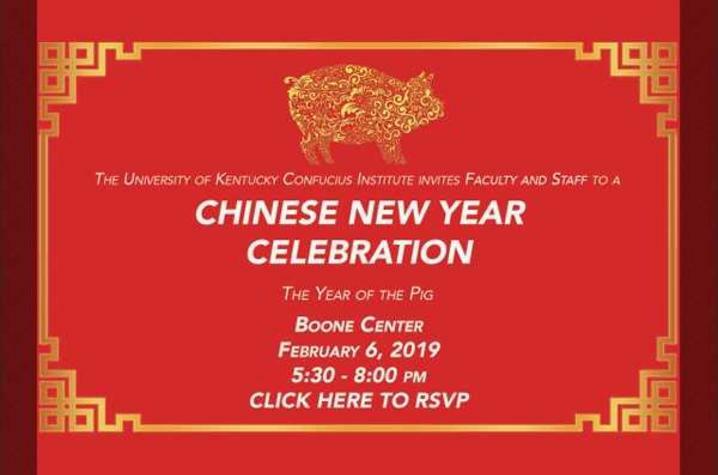 LEXINGTON, Ky. (Jan. 30, 2019) — The University of Kentucky Confucius Institute (UKCI) will welcome in the Year of the Pig by hosting its fifth annual Chinese New Year Celebration 5:30-8 p.m. Wednesday, Feb. 6, at the Hilary J. Boone Center. Guests will be served a festive dinner and will experience a cultural performance of Chinese folk music by the Zhou Family Band. Attendees also will be able to learn about China-related opportunities for faculty and how UKCI supports the university. Tables at the festivities will allow guests to try a variety of Chinese cultural activities. In addition, attendees will hear from President Eli Capilouto and be able to take part in prize drawings throughout the night. At the event, participants will receive a red envelope, which symbolizes good luck and is a common gift for the annual celebration. Reservations for the festivities are available to UK faculty and staff. Those interested in attending the event can RSVP here. The pig is a symbol of wealth and fortune. Pigs are known to have a beautiful personality and can be blessed with good fortune. Each year one of the 12 zodiac animals represents the Chinese New Year. UK Confucius Institute will host a Chinese New Year Celebration for faculty and staff Feb. 6, at Hilary J. Boone Center.